It’s summertime and we all know what means- backyard barbecues! Be a true grill master when you take your meat to the next level with Weber Original BBQ Marinade Mix. This smoky-sweet marinating mix is ideal for punching up pork, chicken, and beef to make your summertime dining picture perfect! 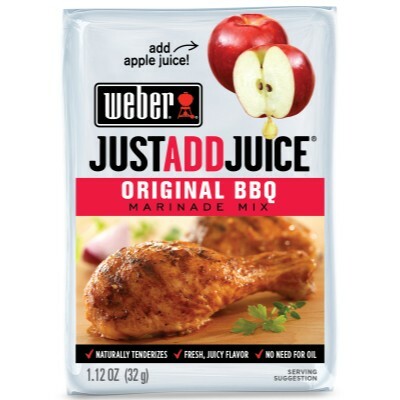 Combine marinade mix with 120ml lemon juice in a resealable plastic bag, mix well. Add 450 to 900g meat, place sealed back in refrigerator for 30 minutes or longer, turninig bag occasionally. Remove meat and discard remaining marinade, grill on preheated cooking grates. Sugar, sea salt, chili pepper, other spices, maltodextrin, garlic, onion, modified food starch, molasses, preservative E262ii, tomato, brown sugar, anti-caking agents E552-E470, natural flavor, wheat starch, soy flour, red pepper, thickening agent E415, natural smoke flavor, soy lecithin E322, vinegar, color E160c, less than 2% of: anti-caking agent E551. Contains wheat, soy. Contains GMO. Nutrition facts (for 100g): calories 333Kcal, total fat 0g (saturated fat 0g), total carbohydrate 66.7g (sugar 33.3g), protein 0g, salt 17.5g.